Not to be confused with Podiatry. This article is about the branch of medicine. For the journal, see Pediatrics (journal). For the branch of dentistry, see Pedodontics. A pediatrician examines a newborn. Pediatrics (also spelled paediatrics or pædiatrics) is the branch of medicine that involves the medical care of infants, children, and adolescents. The American Academy of Pediatrics recommends people be under pediatric care up to the age of 21. A medical doctor who specializes in this area is known as a pediatrician, or paediatrician. The word pediatrics and its cognates mean "healer of children"; they derive from two Greek words: παῖς (pais "child") and ἰατρός (iatros "doctor, healer"). Pediatricians work both in hospitals, particularly those working in its subspecialties such as neonatology, and as outpatient primary care physicians. 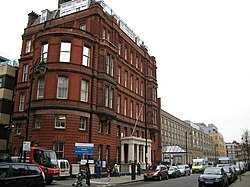 Part of Great Ormond Street Hospital in London, United Kingdom, which was the first pediatric hospital in the English-speaking world. Already Hippocrates, Aristotle, Celsus, Soranus, and Galen understood the differences in growing and maturing organisms that necessitated different treatment: Ex toto non sic pueri ut viri curari debent ("In general, boys should not be treated in the same way as men"). Some of the oldest traces of pediatrics can be discovered in Ancient India where children's doctors were called kumara bhrtya. Sushruta Samhita an ayurvedic text, composed during the sixth century BC contains the text about pediatrics. Another ayurvedic text from this period is Kashyapa Samhita. A second century AD manuscript by the Greek physician and gynecologist Soranus of Ephesus dealt with neonatal pediatrics. Byzantine physicians Oribasius, Aëtius of Amida, Alexander Trallianus, and Paulus Aegineta contributed to the field. The Byzantines also built brephotrophia (crêches). Islamic writers served as a bridge for Greco-Roman and Byzantine medicine and added ideas of their own, especially Haly Abbas, Serapion, Avicenna, and Averroes. The Persian philosopher and physician al-Razi (865–925) published a monograph on pediatrics titled Diseases in Children as well as the first definite description of smallpox as a clinical entity. Also among the first books about pediatrics was Libellus [Opusculum] de aegritudinibus et remediis infantium 1472 ("Little Book on Children Diseases and Treatment"), by the Italian pediatrician Paolo Bagellardo. In sequence came Bartholomäus Metlinger's Ein Regiment der Jungerkinder 1473, Cornelius Roelans (1450–1525) no title Buchlein, or Latin compendium, 1483, and Heinrich von Louffenburg (1391–1460) Versehung des Leibs written in 1429 (published 1491), together form the Pediatric Incunabula, four great medical treatises on children's physiology and pathology. The Swedish physician Nils Rosén von Rosenstein (1706–1773) is considered to be the founder of modern pediatrics as a medical specialty, while his work The diseases of children, and their remedies (1764) is considered to be "the first modern textbook on the subject". Pediatrics as a specialized field of medicine continued to develop in the mid-19th century; German physician Abraham Jacobi (1830–1919) is known as the father of American pediatrics because of his many contributions to the field. He received his medical training in Germany and later practiced in New York City. The first generally accepted pediatric hospital is the Hôpital des Enfants Malades (French: Hospital for Sick Children), which opened in Paris in June 1802 on the site of a previous orphanage. From its beginning, this famous hospital accepted patients up to the age of fifteen years, and it continues to this day as the pediatric division of the Necker-Enfants Malades Hospital, created in 1920 by merging with the physically contiguous Necker Hospital, founded in 1778. In other European countries, the Charité (a hospital founded in 1710) in Berlin established a separate Pediatric Pavilion in 1830, followed by similar institutions at Sankt Petersburg in 1834, and at Vienna and Breslau (now Wrocław), both in 1837. In 1852 Britain's first pediatric hospital, the Hospital for Sick Children, Great Ormond Street was founded by Charles West. The first Children's hospital in Scotland opened in 1860 in Edinburgh. In the US, the first similar institutions were the Children's Hospital of Philadelphia, which opened in 1855, and then Boston Children's Hospital (1869). Subspecialties in pediatrics were created at the Harriet Lane Home at Johns Hopkins by Edwards A. Park. The body size differences are paralleled by maturation changes. The smaller body of an infant or neonate is substantially different physiologically from that of an adult. Congenital defects, genetic variance, and developmental issues are of greater concern to pediatricians than they often are to adult physicians. A common adage is that children are not simply "little adults". The clinician must take into account the immature physiology of the infant or child when considering symptoms, prescribing medications, and diagnosing illnesses. A major difference between the practice of pediatric and adult medicine is that children, in most jurisdictions and with certain exceptions, cannot make decisions for themselves. The issues of guardianship, privacy, legal responsibility and informed consent must always be considered in every pediatric procedure. Pediatricians often have to treat the parents and sometimes, the family, rather than just the child. Adolescents are in their own legal class, having rights to their own health care decisions in certain circumstances. The concept of legal consent combined with the non-legal consent (assent) of the child when considering treatment options, especially in the face of conditions with poor prognosis or complicated and painful procedures/surgeries, means the pediatrician must take into account the desires of many people, in addition to those of the patient. Aspiring medical students will need 4 years of undergraduate courses at a college or university, which will get them a BS, BA, MBBS or other bachelor's degree. After completing college future pediatricians will need to attend 4 years of medical school and later do 3 more years of residency training, the first year of which is called "internship." After completing the 3 years of residency, physicians are eligible to become certified in pediatrics by passing a rigorous test that deals with medical conditions related to young children. In high school future pediatricians are required to take basic science classes such as, biology, chemistry, physics, algebra, geometry, and calculus and also foreign language class, preferably Spanish (in the United States), and get involved in high school organizations and extracurricular activities. After high school, college students simply need to fulfill the basic science course requirements that most medical schools recommend and will need to prepare to take the MCAT (Medical College Admission Test) their junior or early senior year in college. Once attending medical school, student courses will focus on basic medical sciences like human anatomy, physiology, chemistry, etc., for the first three years, the second year of which is when medical students start to get hands-on experience with actual patients. The training of pediatricians varies considerably across the world. Depending on jurisdiction and university, a medical degree course may be either undergraduate-entry or graduate-entry. The former commonly takes five or six years, and has been usual in the Commonwealth. Entrants to graduate-entry courses (as in the US), usually lasting four or five years, have previously completed a three- or four-year university degree, commonly but by no means always in sciences. Medical graduates hold a degree specific to the country and university in and from which they graduated. This degree qualifies that medical practitioner to become licensed or registered under the laws of that particular country, and sometimes of several countries, subject to requirements for "internship" or "conditional registration". Pediatricians must undertake further training in their chosen field. This may take from four to eleven or more years, (depending on jurisdiction and the degree of specialization). In the United States, a medical school graduate wishing to specialize in pediatrics must undergo a three-year residency composed of outpatient, inpatient, and critical care rotations. Specialties within pediatrics require further training in the form of 3-year fellowships. Specialties include critical care, gastroenterology, neurology, infectious disease, hematology/oncology, rheumatology, pulmonology, child abuse, emergency medicine, endocrinology, neonatology, and others. In most jurisdictions, entry-level degrees are common to all branches of the medical profession, but in some jurisdictions, specialization in pediatrics may begin before completion of this degree. In some jurisdictions, pediatric training is begun immediately following completion of entry-level training. In other jurisdictions, junior medical doctors must undertake generalist (unstreamed) training for a number of years before commencing pediatric (or any other) specialization. Specialist training is often largely under the control of pediatric organizations (see below) rather than universities, and depend on jurisdiction. ^ "Age limits of pediatrics". Pediatrics. 81 (5): 736. May 1988. PMID 3357740. Retrieved 18 April 2017. ^ a b c d e Colón, A. R.; Colón, P. A. (January 1999). Nurturing children: a history of pediatrics. Greenwood Press. ISBN 9780313310805. Retrieved 20 October 2012. ^ Celsus, De Medicina, Book 3, Chapter 7, § 1. ^ John G. Raffensperger. Children's Surgery: A Worldwide History. McFarland. p. 21. ^ David Levinson; Karen Christensen. Encyclopedia of modern Asia. 4. Charles Scribner's Sons. p. 116. ^ Desai, A.B. Textbook Of Paediatrics. Orient blackswan. p. 1. ^ P.M. Dunn, "Soranus of Ephesus (circa AD 98–138) and perinatal care in Roman times", Archives of Disease in Childhood: Fetal and Neonatal Edition, 1995 July; 73(1): F51–F52. ^ Elgood, Cyril (2010). A Medical History of Persia and The Eastern Caliphate (1st ed.). London: Cambridge. pp. 202–203. ISBN 978-1-108-01588-2. By writing a monograph on 'Diseases in Children' he may also be looked upon as the father of paediatrics. ^ Lock, Stephen; John M. Last; George Dunea (2001). The Oxford illustrated companion to medicine. Oxford University Press US. p. 173. ISBN 978-0-19-262950-0. Retrieved 9 July 2010. ^ Roberts, Michael (2003). The Age of Liberty: Sweden 1719–1772. Cambridge University Press. p. 216. ISBN 978-0-521-52707-1. Retrieved 9 July 2010. ^ Dallas, John. "Classics of Child Care". Royal College of Physicians of Edinburgh. Archived from the original on 27 July 2011. Retrieved 9 July 2010. ^ a b Ballbriga, Angel (1991). "One century of pediatrics in Europe (section: development of pediatric hospitals in Europe)". In Nichols, Burford L.; et al. History of Paediatrics 1850–1950. Nestlé Nutrition Workshop Series. 22. New York: Raven Press. pp. 6–8. ISBN 0-88167-695-0. ^ Young, D.G. (August 1999). "The Mason Brown Lecture: Scots and paediatric surgery". Journal of the Royal College of surgeons Edinburgh. 44: 211–5. Archived from the original on 2014-07-14. ^ Pearson, Howard A. (1991). "Pediatrics in the United States". In Nichols, Burford L.; et al. History of Paediatrics 1850–1950. Nestlé Nutrition Workshop Series. 22. New York: Raven Press. pp. 55–63. ISBN 0-88167-695-0. ^ "Commentaries: Edwards A Park". Pediatrics. American Academy of Pediatrics. 44: 897–901. 1969. ^ "What Education Is Required to Be a Pediatrician?". Retrieved 2017-06-14. 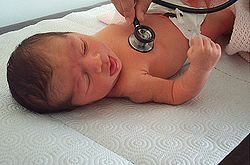 Wikimedia Commons has media related to Paediatrics. Look up Paediatrics or Pediatrics in Wiktionary, the free dictionary. Pediatric Collection by the BMJ – Collection of Pediatric papers published in the British Medical Journal.